L'Ecuyer's Gourmet: Pectin - is it GMO? In a discussion on Facebook tonight, I came to realize that in trying to follow a Paleo diet and be as chemical free what is one to do when trying to can a Paleo jam or jelly? They require sugar typically and a pectin! But, what pectin to use and is it a GMO product? I have been looking seriously hard at what our foods are made of of late and this is becoming more and more important to me. I was at Whole Foods last night who ensure they will not utilize anything that is GMO. They only had a couple of 'pectin's' in their store. One that is a 'true' pectin is Pomona's. It is a low-sugar pectin that could easily be used in canning for Paleo. Unfortunately I have never used it myself as it is made from 'citrus' and likely has lemon citrus in it. They were not able to confirm to me what citrus is used. I can use lime but not lemon (yes, I know this is weird, but I never said I wasn't! LOL). I know many canners that have used this quite successfully and it uses very low sugar. But, what sugar can you use? Honey is often used in canning and is very Paleo! How about maple syrup? That is also very Paleo! These are all natural sugars and are acceptable in canning. I will have to do some experiments with canning to find what works as I'm allergic to honey and can't use the Pomona's myself but I could do it and give it to friends. I just would have to have family taste it! 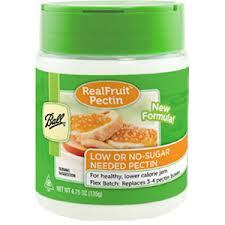 The other 'pectin' they had in Whole Foods was actually a form of gelatin. Gelatin isn't an approved pectin in canning so I wouldn't advise using that. 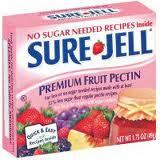 Lastly, the only pectin that I can use is Sure-Jell. I will check with them if it is GMO. I just can't verify it. It is made in Mexico and uses limes only. I have confirmed that much. Otherwise I will have to start making my own which is quite time consuming. I can't use apples so this will prove to be a problem for me. If you want to be Paleo and GMO free, don't use Ball FlexBatch as it is very much chemically made. The one time I had a friend give me something she made that she had used it, I blew up like a puffer fish! Definitely a no go for me! As always, add an 'acid' such as lemon or lime juice (free of sulfites of course!) to can your jam or jelly! If you have any questions, please feel free to ask. I can look at a recipe and help you convert it if need be! Have a great evening! I've been thinking about where vinegar comes from. I use it in all my cleaning. I have thought about making it myself...and we have inadvertently with a ruined batch of kombucha! I haven't put a lot of research into it because there isn't much to find! Hadn't thought about vinegar. I'll have to look into it! Thanks!